We might be getting a TV show about Peggy Carter, and here's why you should care. 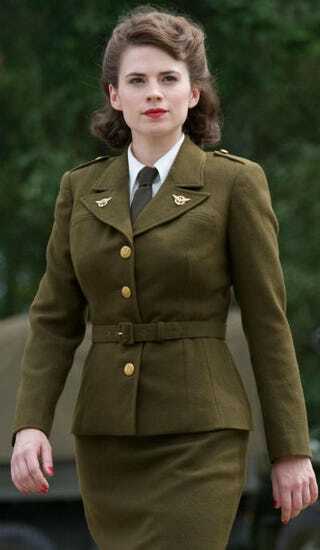 Having seen Captain America: The Winter Soldier twice by now, I've been thinking about Peggy Carter a lot lately. Moviegoers first met Carter, played by British actress Hayley Atwell, in Captain America: The First Avenger in which she is a soldier and Cap's love interest. Carter shows up again in an emotional cameo in the sequel to The First Avenger — Captain America: The Winter Soldier. In CA:TWS, we learn that Peggy helped found SHIELD, the intelligence agency that features prominently in the Marvel Cinematic Universe, of which CA:TWS is a part. As of the events of CA:TWS, Carter is the only surviving SHIELD founder, having apparently outwitted or escaped those who killed the other founders. That fact Carter helped found SHIELD is interesting for a few reasons. For one thing, it seems that the name SHIELD, which stands for Strategic Homeland Intervention, Enforcement and Logistics Division, could be a tribute to Cap's most famous accessory: his near-indestructible shield. Secondly, her involvement with the beginning of SHIELD serves as an inadvertent subversion of the comic book trope known as fridging, wherein a person important to the hero, usually a female love interest, is killed for the sake of spurring the protagonist to avenge the death or at least accomplish of a great deed. In helping found SHIELD in response to Steve's death, Carter essentially reversed the fridging trope. Carter's achievements don't stop or end with founding SHIELD, though. In The First Avenger, she's no slouch, often holding her own in overwhelmingly male environments such as the Camp Lehigh Army base at which she served and the secret labs of the Strategic Scientific Reserve, the project that created the serum that made Steve Rogers into Captain America. Aside from the movies, Carter is also featured in the Marvel comics, logging almost 100 appearances, usually alongside Cap or The Avengers. Unlike her movie counterpart, the comic book Carter did not help found SHIELD, but she is still a trained fighter and a member of the French Resistance during WWII. Carter's heroism also inspired her niece Sharon Carter, who would go on to become a comics hero in her own right. A TV show about Peggy Carter has been rumored for a while now, and unlike a lot of potential new shows, it has the advantage of having already been tried out … sort of. A short movie about Peggy called, well, Agent Carter, was produced as an add-on to the Iron Man 3 Blu-Ray, and overall it was well-received by critics. What's even more promising is that an Agent Carter TV series has all but been announced: Deadline.com reported last week that a pilot for Agent Carter is likely to be given the go-ahead. An Agent Carter TV show would be a great step in a right direction for Marvel Studios, which oversees the MCU. By all accounts, the MCU has been a smashing success, but there is one glaring flaw: there are nine movies (with more on the way) and one TV show that have taken place in this continuity, and none of them have featured a female solo lead. There are just as many amazing female heroes as there are male heroes in the overall Marvel universe, and while I'd personally still like to see a MCU film with a female lead, I could live with a woman-led TV show for the time being. Agent Carter herself, Hayley Atwell, has expressed hope for a TV series, and hopefully the powers that be over at Marvel are listening. Top image via the MCU Wiki.